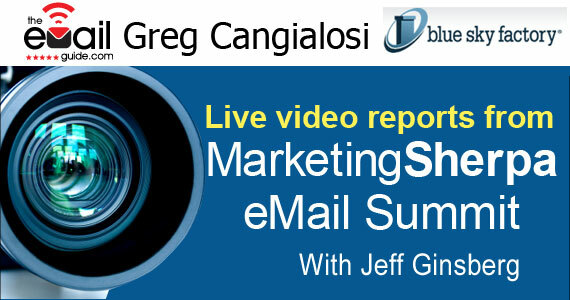 Jeff Ginsberg, Chief Email Officer of The eMail Guide, talks email marketing with Greg Cangialosi, CEO of Blue Sky Factory at the MarketingSherpa eMail Summit 2010 in Miami. Blue Sky Factory is an email service provider with a combination of self service and full service solutions. Publicaster is BSF’s self serve solution but, they all so provide a full agency solution as well with client service managers, strategy, creative, all the way down to reporting, analytics and optimization. About 85 percent of their business is self serve and 15% is agency side. Blue Sky Factory’s value proposition is to not lead with the technology. They feel a lot of the technology in this marketplace is being commoditized. Because of this they focus more on the client service relationship and making sure they are aligned with a client’s marketing goals, helping achieve those goals. They’ve introduced new tools and features such as the “Share With Your Network” and the “Social Subscribe” feature, which allows content that’s designed for the inbox to be shared with the social web, something relatively new for email. Greg and Jeff also touch on the issue of “CPM” and whether there is a devaluation of the service and technology with the continued commoditization of email marketing. Considering the rates of the postal service for direct marketing and the complete lack of any reporting, are we paying a fair rate for marketing via email? It’s a provocative discussion which should generate some thought on the subject. 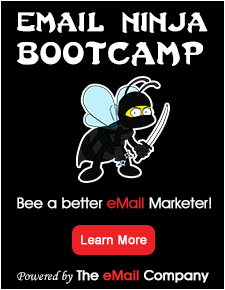 From our POV here @ The eMail Guide, we’ve seen email marketing shops get very social and BSF has done a phenominal job is showing how social they can be. Takeaway: It’s hard to differentiate on the technology side, so you have to compliment your offerings with services and make sure your customers become better marketers and that is a challenge. @Jeff – Thank you very much for the kind words. I appreciate it very much! We are really excited to be involved with the blog! @Garin – you hit the nail on the head! glad you enjoyed the video and thanks for watching. Thanks for your interest in our product offerings as well. If you want to learn more I would be happy to connect you with the right folks. It’s great to have you, Nikki and DJ as part of out community here @ The eMail Guide Greg! The “sky” is the limit! Loved doing the interview. Your insights and understanding of the digital space go far beyond email. When I think of Social Marketing your company bar far is at the top of the list. I appreciate the kind words and the fact that your team has taken a very active role on our blog. 1. 2010 is going to be the year of social acceleration. 2. Email is the digital glue. 3. Mobile is going to be huge. This video makes me very curious about the Blue Sky Factory product offerings that help socially syndicate and accelerate newsletter content. Blue Sky seems to me to be a socially savvy email marketing company and I am even following them on Twitter @blueskyfactory! I think they only way mobile will be huge is with the devise and not the transfer method. I think SMS is never going to amount to much due to the prohibitive delivery costs and the fact that it is so limited in the amount of information you can track. Many devices have email and now with Twitter and Facebook being so portable, SMS’s days are over in my mind. Anyone out there able to prove me wrong?